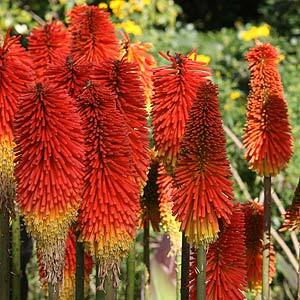 Kniphofia or ‘Red Hot Pokers’ are a plant that prefers a position in full sun in a humus rich, moist well drained soil. Sometime called the ‘Torch Lily’ these easy care plants come in a number of varieties. Firstly they are not always red, the tall flower spikes from red through to yellow rising above the foliage. These plants add height make a dramatic addition to the garden. Plants are readily available for sale online. Kniphofia ‘Winter Cheer’ makes a stunning display during the cold months with its bright red flower heads, ‘Orange Queen’ has softer orange flowers. The softer variety ‘Lime Glow’ is a yellow form. Species include: K. citrina, K. linearifolia, K. sarmentosa, K. thompsonii, and K. ‘Zululandiae’. These are a medium to tall growing perennial that can make a dramatic statement at the rear of the border or as a stand alone plant. Kniphofia have flower spikes that reach to nearly 2m and a range of colors from bone white through to coral red. They will flower from early summer to late summer depending on variety. All varieties do prefer full sun and a moist but well drained soil, once established they are relatively drought tolerant. You prune the foliage back to around ground level in late autumn to late winter, this will tidy the plant up. The fresh new foliage in spring looks better than the old foliage. Easiest by division of established clumps. 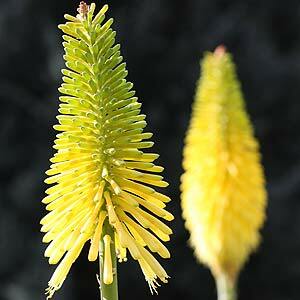 The best time to divide Kniphofia is in in autumn or spring. Lift the clump if possible with a garden fork. Use a sharp spade to to divide the clump and then replant. After replanting, water in with a liquid seaweed fertiliser. You can also propagate from seed. Seeds are best planted in autumn in a specialist seed raising mix. They should germinate in around 3 – 4 weeks and be ready for potting up abount 6 months after germination. Seeds usually do not come true to colour. K. ‘Red Hot’ has deep coral red flowers. K. ‘Ernest Mitchell’ has clear lemon-green flowers. K. ‘Lollipop’ has a flower head shaped like a ball on a stick. K. northiae has very large decorative foliage.